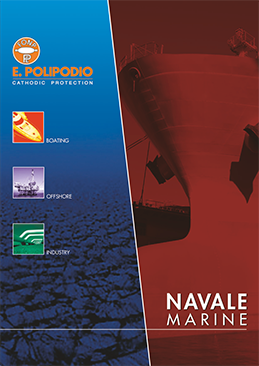 E. Polipodio can offer one of the widest range of anodes in the boating markets, mainly on stock, but is also capable to produce on custom demand at reasonable short notice. Besides the traditional gravity casting technique, still applied , the die casting method has been introduced in the production, especially for complex shaped components requiring a high dimensional accuracy (like engine anodes). This has allowed the reduction of secondary machining operations, increasing the production rates, and improving the quality standards. Galvanic or sacrificial anodes are designed and manufactured with a more negative electrochemical potential than the metal of the structure to be protected. 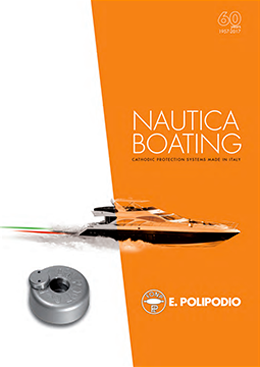 While submerged hull areas can be protected by means of galvanic sacrificial anodes or installing an active Impressed Current Cathodic Protection (ICCP) system, the preferred technique to protect recessed areas (sea chests, thrusters, etc…) and tanks is by means of galvanic anodes. Galvanic anodes are available on stock in a wide range of shapes , sizes and materials (Zinc, Aluminium, Magnesium) and fixing type (welding or bolting) but customised solutions can also be provided upon request . The galvanic anode continues to corrode (sacrifice), consuming the anode material until it requires replacement. The polarisation of the structure to be protected is caused by the current flow from the anode to the surface itself (cathode), and the driving force for the cathodic protection current flow is the difference in electrochemical voltage potential between the anode and the cathode. Platform stand off and bracelet anodes for pipelines are available in a wide variety of sizes and insert dimensions. Nevertheless the anodes and the inserts can be customised to meet the specific requirements and the fixing constraints of each project. 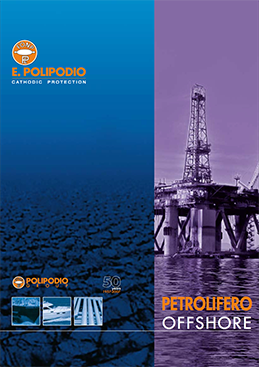 Besides the installation of anodes for new rigs, jetty, wind farms and pipelines, E. Polipodio has developed and applied several solutions to retrofit cathodic protection systems on existing platforms and offshore structures. Structures in an offshore field, whose life has been extended further than originally foreseen. This led to the design and the development of anode sled and pod systems that allow the application of cathodic protection systems reducing the diver time and the underwater welding, delivering quick and adequate protection solutions and reducing installation costs. The passive cathodic protection is based on the use of galvanic anode special alloy products that are applied to the surface to be protected. Sacrificial anodes have been used to protect tanks, onshore pipelines, intake screens, water processing units, in short anywhere that steel is in contact with water. In saltwater Aluminium or Zinc are commonly used, whereas in fresh or brackish low resistivity water, Magnesium is mostly used. 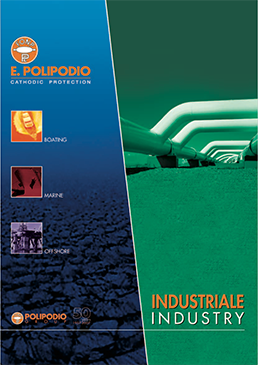 E. Polipodio has extensive experience in designing cathodic protection systems and can supply anodes from the range of standard design or prepare special anodes to support customer requirements in order to help in minimizing the costs and maximizing the protective life. Sacrificial anode cathodic protection is considered as a cost effective solution for a variety of submerged marine structures and is the oldest form of cathodic protection. Sacrificial anodes for marine applications are predominantly either aluminium or zinc: Al alloy anode materials are mostly preferred due to their higher electrochemical efficiency which reduce considerably the total weight installed on a structure and provide a more cost effective cathodic protection system than second alloy anodes. A wide range of structures immersed in seawater have been protected by cathodic protection using either impressed or galvanic systems. The latter are generally applied principally for their high reliability and low maintenance requirements. These are mainly in order to fight a supposedly new form of microbiologically induced corrosion called Accelerated Low Water Corrosion (ALWC) visible on large numbers of immersed metallic components (tubular steel piles and sheet piles) and often occurring at the lowest astronomical tide level.